the statue of liberty is 250 feet tall. the very huge shiny spaceship is on top of the statue of liberty. the statue of liberty is leaning to the right. there is a 250 foot tall cylinder under the spaceship. the cylinder is 40 feet wide. the cylinder is transparent. the ground is brown. the second very big gray shiny spaceship is 75 feet left of the cylinder. the second spaceship is leaning to the right. the second spaceship is leaning right. the third very big gray shiny spaceship is 50 feet above the second spaceship. the third spaceship is leaning backwards. the big red rock is 590 feet right of the cylinder. the red light is under the third spaceship. 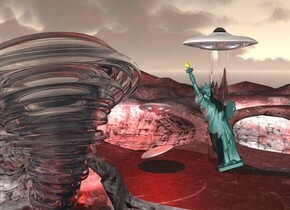 the 600 feet tall tornado is transparent and in the ground. I'll get it honey, don't worry. The man is 48 feet above the ground. The man is leaning to the right. The very big gray shark is behind the man. The shark is leaning to the left.. the blue light is 100 feet above the ground. The first huge jellyfish is 51 feet above the ground and 10 feet to the right. The third very huge jellyfish is 51 feet above the ground and 14 feet to the right. 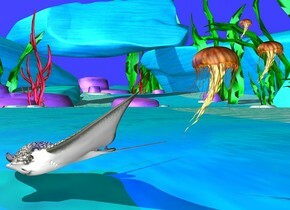 The second huge jellyfish is under the shark. the big red shoe is in front of the man. the red shoe is leaning left. the sky is bright blue. The ambient light is gray. the first jellyfish is 2 feet above the ground. the second small jellyfish is 3 feet above the ground. the third big jellyfish is 1 feet above the ground. the 1 feet tall fish is in the ground. the fish is leaning to the right. the blue light is above the fish. There are 3 aliens. the ground is shiny green. the shiny gray spaceship is behind the aliens. the 10 feet tall tree is behind the spaceship. 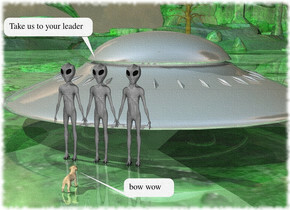 the dog is 2 feet in front of the aliens. the dog is facing the aliens. the pizza is on a shiny wood table.the crow is on the pizza. the second pizza in front of the crow. the second pizza is 7 inches above the table. the second crow is on the second pizza. 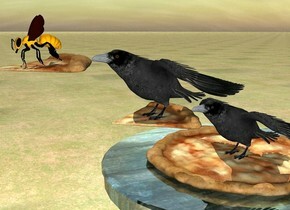 the third pizza is in front of the second crow. the third pizza is 3.2 feet above the ground. the ground is grass. the huge bee is on the third pizza. the ground is shiny gray. there is a snowflake. there is a snowflake behind the snowflake. there is a snowflake behind the snowflake. there is a snowflake behind the snowflake. there is a snowflake behind the snowflake. there is a snowflake behind the snowflake. there is a 10 feet tall clear shiny sphere next to the snowflakes. the ambient light is aqua blue. 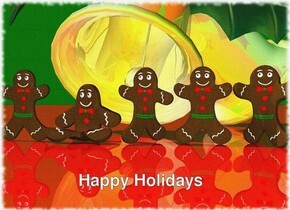 the shiny white gingerbread man is 2 feet right of the sphere. the gingerbread man is facing east. 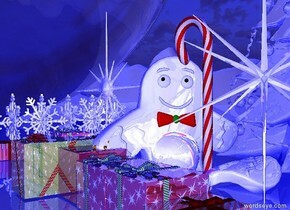 the candy cane is -.3 feet left of the gingerbread man. the ornament is right of the candy cane. the second ornament is left of the candy cane. the third ornament is left of the second ornament. there are 5 shiny tiny gifts 2 inches in front of the candy cane. there are 8 shiny tiny gifts 2 inches right of the snowflakes. there is a tiny shiny gray tree behind the gingerbread man. There are 5 cookies. the ground is shiny red. the 5 feet tall ornament is behind the cookies. the sky is green. the ground is stone. there is a door. the wreath is 4 feet above the ground in front of the door. the first tree is on the right of the door. santa is to the left of the door. there are 5 gifts in front of santa. there are 6 gifts in front of the tree.there are 10 gifts 3 feet in front of the door. there are 10 gifts 3 feet in front of the door. the very long brick wall is behind the door. the 5 feet tall caribou is 4 feet in front of the tree. 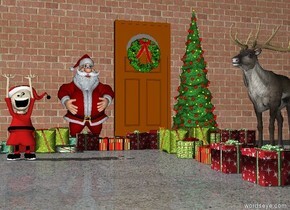 the caribou is facing santa. there are 10 gifts left of caribou.the elf is 5 feet in front and .2 feet left of santa. the brick wall is very tall. The ground is shiny moon. The shiny blimp is 20 feet above the ground. the blimp is cloudy. the second shiny blimp is 200 feet behind the blimp. The 50 feet tall shiny sphere is to the right of the blimp. The sphere is cloudy. The second 75 foot tall shiny sphere is 100 feet left of the sphere. The second sphere is cloud. The unicorn is 10 feet tall.. The ambient light is blue. There is a green light under the unicorn. There is a second green light above the unicorn. There is a yellow light in front of the unicorn. 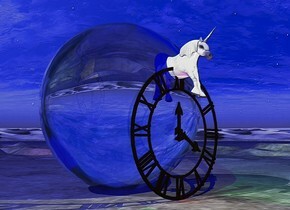 The unicorn is in the center of the clock. The clock is 20 feet tall. the 30 feet tall transparent shiny beach ball is behind the clock. There is a red light in front of the clock. The sky is cloudy. There is a big turtle. 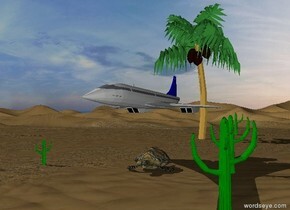 The small airplane is 5 feet above the turtle. The small green cactus is 13 feet left of the turtle. The second green cactus is 5 feet right of the turtle. The third green cactus is 18 feet in front of the second cactus. The fourth green cactus is 100 feet behind the green cactus. The tree is 40 feet behind the turtle. the ground is tall. There is a small house. there is a second small house right of the house.. There are 5 cars 3 feet in front of the houses. the cars are 2 foot apart. There are five trees behind the house.the trees are 30 feet tall. There are five trees 30 feet behind the car. There is a shiny gray rocket ship. The sky is black. The shiny spaceship is 6 feet to the right of the rocket. The spaceship is leaning to the right. 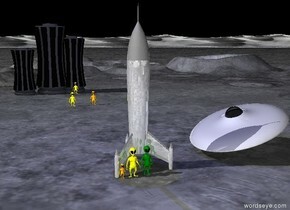 The first light green alien is in front of the rocket. The second yellow alien is to the left of the first alien. The third small orange alien is to the left of the second alien. There is a 30 feet tall skyscraper 90 feet behind the rocket. The 20 feet tall second skyscraper is to the left of the skyscraper. The 25 feet tall third skyscraper is 10 feet to the right of the skyscraper. 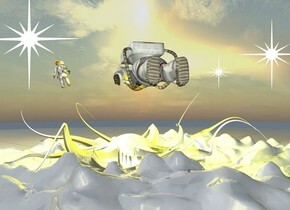 The fourth yellow alien is in front of the skyscraper. The fifth orange alien is 30 feet in front of the fourth yellow alien. The sixth yellow alien is 5 feet to the left of the fifth orange alien. The bright midnight blue light is above the rocket. The castle is cloudy. There is a very enormous shiny gray sphere above the castle. 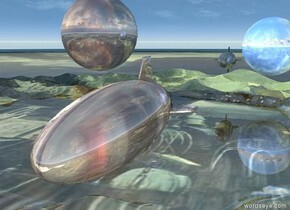 There is a shiny large globe to the right of the sphere. The globe is 10 feet to the right. The small hot air balloon is under the globe 50 feet to the left. The hot air balloon is leaning to the left. The huge shark is 30 feet in front of the castle. The shark is facing the globe. The shark is 5 feet above the ground. There is a very enormous fish 70 feet to the right of the hot air balloon. The fish is facing the hot air balloon. The fish is leaning forward. The shark is leaning to the left. The orange light is one foot above the ground. The second red light is under the fish. The ground is shiny black. 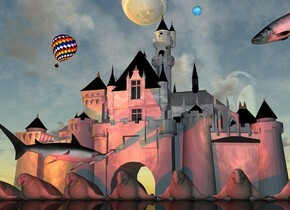 There are 8 huge elephant seals in front of the castle. The ground is grass. The orange pumpkin is on the ground. The big bat is above the pumpkin. 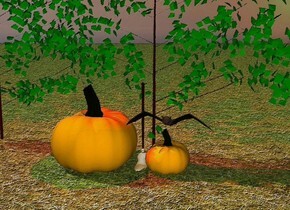 The small broom is next to the pumpkin. There is a big bat to the left of the bush. There is a bush behind the broom. There is a big orange pumpkin to the left of the broom. There is red light above the pumpkin. The cup is on a table. The shiny mirror is behind the cup. There is red light to the right of the cup. There is a green light to the left of the cup. The ground has shiny tile texture. The dog is to the right of the table. The cat is to the left of the table. There is a big rat in front of the table. The rat is facing the dog. 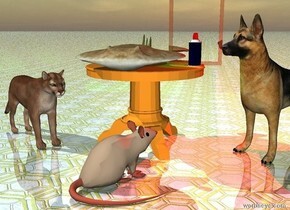 The dog is facing the rat.The cat is facing the rat. The food is on the table. There is a plate on the black shiny ground. There is big glass to the right of the plate. The globe is to the left of the plate. There is a huge glass behind the globe. There is a very big glass in front of the globe. There is a very bright red light above the plate.. 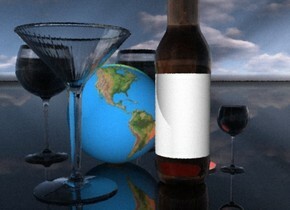 There is a very big bottle in front of the plate. There is a yellow light above the glass. There is a huge glass left of the globe. The fan is on the table. The huge window is on the table. The window is two feet in back of the table. The man is in front of the table. 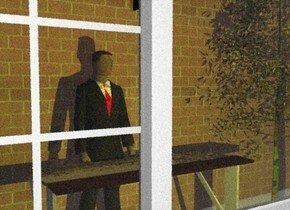 The man is facing the window. The huge brick wall is in front of the man. The bright yellow light is in front of the window. The very small house plant is on the left of the table. The glass is on the table. There is a house on the ground. The ground has a grass texture.. There is a small pine tree to the left of the house. There are five maple trees behind the house. There are ten rubber trees behind the maple trees. There are ten cherry trees behind the maple trees. 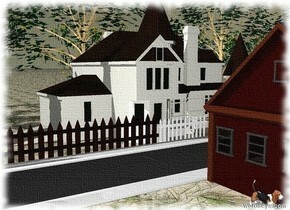 There is a long fence in front of the house. There is a small volkswagen to right of the house. There is a small red volkswagen bus five feet to the right of the house. There is a long fence next to the fence. There is a long fence next to the fence. There is a long street in front of the fence. The street is facing left. There is a street to the right of the street. The street is facing left. There is a house in front of the street. The house is facing left. There is a basset hound to the left of the house. 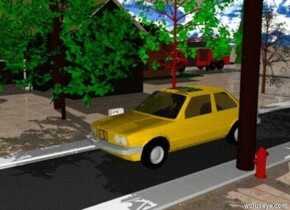 a car is on the very long street. 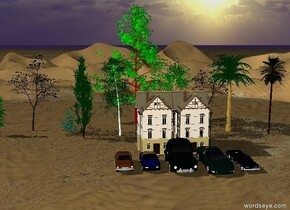 There is twenty small trees next to the street. The ground has a dirt texture. There is a mountain in the background. There is a hydrant to the right of the street. There is a telephone pole next to the hydrant. There is a mailbox two feet from the street. There is a barn 20 feet from the street. There is a house to the back of barn. There is a truck to the back of the house. There is a street light to the right of the truck. There is a small pine tree ten feet to the right of the light. 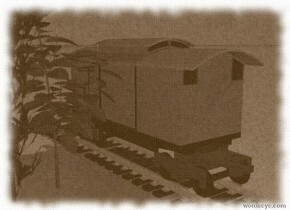 The train is on the very long track. surrounded by trees.